If there’s one thing that secular progressive liberals, the vast majority of professing American Christians, and Satan can agree on, it is this: The Word of God is not to be our source, standard, and blueprint for education, economics, business, law, government and politics right here and now on planet earth, in America or anywhere else. For secular liberals and Satan, the reasons for this are fairly obvious, so I won’t waste much time here addressing them. I’m more than content to assume that readers will need nothing in the way of evidence for the charge that secular liberals and the Devil are fairly serious in their opposition to the Nature of God as revealed in His Word being actively applied as the basis for anything substantive in the formation or management of culture and civilization. That part seems automatic and plain enough. So what’s up with the vast majority of professing conservative Christians who share this obviously worldview-defining position? Well, if you’re anywhere near where I was just a few years back, you probably don’t have an answer on the tip of your tongue because you’ve never even thought of things in that light before. Those are the two general vibes and approaches taken by most of those who both claim an orthodox Christian worldview and are inclined to take a quick stab at answering these sorts of questions. While the way I phrased these responses is unlikely to be the way actual responses are formed, it has been my experience that some, if not all of the substantive beliefs contained in the above renditions are conveyed in the vast majority of initial responses from professing Christians when the subject of their relationship to the law of God comes up. The first theme is straight out of Gnosticism. It centers on the notion that the physical world is inherently bad, the spiritual is inherently good, and that since the Kingdom of God is spiritual, it cannot be effectively applied in the physical realm. This is wildly unbiblical. The path to being “in the flesh” and “of the world” begins in the spirit. It begins in the heart. It begins with pride. None of these things are physical. Conversely, and most importantly, the Kingdom of Christ is anything but exclusively immaterial. He owns every immaterial thing and every material thing. They were all made by Him, through Him, and for Him. Lest there be any confusion, “everywhere” means physical places, “everyone” means physical people, and “everything that He has commanded” pertains to everything that He has said pertaining to each and every material and immaterial thing or concept in all of His creation. These fundamental truths have been so lost for so long by most professing Christian people and churches in America that they are not only unfamiliar, but they are more often than not vigorously opposed by most professing believers. Pursuing the faithful application of the Law of God is akin to pursuing Ebola in the eyes and hearts of many. The thought of actually calling physical people in physical places to actively obey every command of Christ the King here and now is viewed and treated by many as an evil contagion to be suppressed and opposed at all costs. These folks, many of whom, I am convinced (as much as I can be, anyway) are indeed true Christian Brothers and Sisters, have been led to this place by way of one of the most pernicious perversions of the Gospel to ever hit the Church: The gospel in a bottle. This spin on the true Gospel strips it of any and all necessary attachment to the nature of Christ as revealed in His Word beyond that which speaks directly to soteriology (the nature of salvation or “how we are saved”), and even that can get tossed under the bus at times by this phony gospel’s proponents. While one of the most beautiful truths about the undiluted, supernatural Gospel of Christ is that our salvation is completely and entirely initiated, accomplished, and sustained by the grace of God alone through faith alone in Christ alone, and that nothing whatsoever that we do in even the slightest little way at any point in time contributes anything at all to the pursuit, apprehension, or preservation of that supernaturally imposed salvation, we are still saved unto obedience. 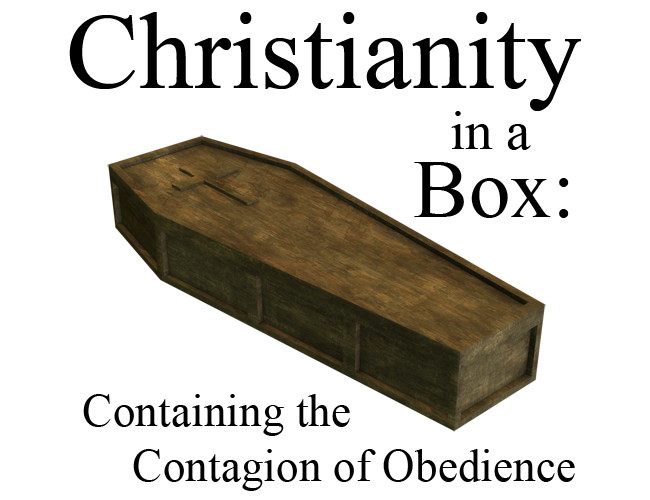 We are saved unto conformity to Christ, which comes as we grow in desire for and application of that obedience. And we can only know what “conformity” and “obedience” mean in this context in light of what He has given us by way of perfect, sufficient revelation in His Word. While we are certainly not saved by good works, we are just as certainly saved unto good works. While we are certainly not saved by our understanding, doctrine, or theology, we are just as certainly saved unto the pursuit of more accurate and true understanding, doctrine, and theology…as He has lovingly defined all of them in His Word. The Great Commission command to “make disciples of the nations” and teach them to obey all that Christ has commanded is quite literally impossible to even seriously begin, much less vigorously pursue or accomplish, if we are operating under the profound delusion that we are to seek the wisdom of man – any man – over the wisdom of God here and now on earth in the realms of economics, education, politics, law and the like, even when those very subjects are lovingly and thoroughly addressed in His perfect and sufficient Word. Now, on a practical level, are we going to disagree as to what those details contained in His Word actually say? Yes. Certainly. On this side of His physical return and the end of this age, we are going to see things imperfectly, and therefore true believers will have different understandings as to what the details are in a variety of subjects addressed in Scripture. While I very much look forward to exploring some of those concerns in some detail in future posts, Lord willing, for now, I would like to focus our attention more narrowly on the overall principle by which we will pursue those sorts of examinations, discussions, and considerations. The basic biblical idea I’d like for each of us to consider is this: Can we at least agree that the Word of God, where it has spoken in detail on any subject, is the standard by which we should test those things. Since the Word is literally the revelation of God’s nature to mankind, each and every detail tells us something vital about about Him personally. His Word on law, economics, and education are each and every one of them personal revelations of His very nature. This is why they are the keys to life and prosperity and peace in every area that they address. They are not just rules. They are not just guidelines. They are not just good ideas or potentially helpful suggestions. Jesus Christ is the Word made flesh and His sacrifice has freed those for whom He died from the burden of the law in any punitive sense. He has kept the perfect Law perfectly on our behalf…which out to tell us something about not only His love for us, but His view – and love – of that Law. He has paid the price of our disobedience. All of it. And forevermore. And He has commanded that we love Him with all that we have and are. What does that love look like? As the Spirit of God through John recorded, If we love Him, we will keep His commandments. Not because keeping them saves us, or keeps us saved. But because we love Him…as He has lovingly commanded us to do…by His grace, for His glory, and to our eternal benefit. These are the truths that are murdered and buried by the gospel in a bottle – a gospel that touches nothing and challenges no one; a gospel that centers on the feelings and opinions of men rather than the revelation of God through His Word and Son, the Word made flesh. The Great Commission is not vague, it is not weak, and it is not expired. It is real, it is all encompassing, and it is on….so let’s get to it.